I decided – why not share some of them in a blog post too? This way, even if you do not have a Facebook account you can still find some fantastic inspiration all in one place! While I share each link with a preview image on Facebook I am unable to do so here in one post – it would take much too long to load the page and I would have to contact every one of these Great Designers for Permission to share their images. I have shared some images in my round up cover photo for which I have already received permission from the Designers – the rest of the fantastic free patterns are listed by post title and link! So grab a cuppa and get cozy! This is my first post of this kind – and if you like it then I will keep doing a post like this each month. If not – then this may just be the one-and-only Facebook Flashbook Free Pattern Blitz Post! 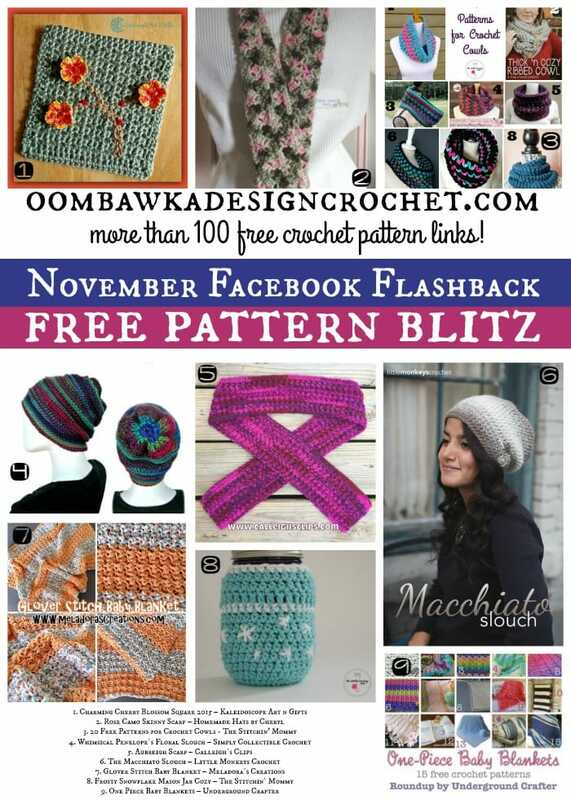 Oombawka Design Crochet’s Facebook Page in November 2015. Phew! Those are a lot of links! I hope you find something in the selection to inspire you!